Popular design Sterling Silver Mens Heavy Rings and Large Bulky Chunky 925 Silver Rings. Chunky Silver rings are the latest trend for Ladies and Men to wear in Contemporary designer jewellery. 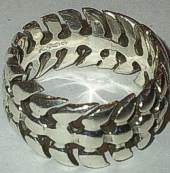 We also stock Heavy Metal Jewellery and Heavy Rocker or Biker design Large Rings with MotorBike related designs. 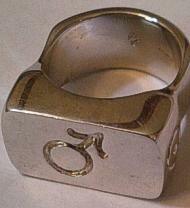 Large Sterling Silver Ring with MALE Gender symbol design and solid 925 heavy Ring shank. Heavy Sterling Silver Mens Motorcycle design Massive Ring with Bull Horns on front and Motorcycle exhaust pipes design. Solid Sterling Silver Biker Ring, heavy Mens detailed Motorbike type design 925 Rings. 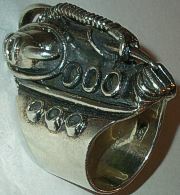 Massive Sterling Silver solid Futuristic Design Space Craft type Spaceship style long Ring. Sterling Silver Spine Ring in the shape of Back Spine Bones all around ring band. 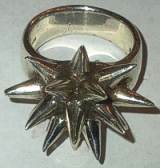 Solid Sterling Silver Spikes Ring with Pointed Spikey design.